With the numerous sources to get organic produce, I'm in veggie heaven. We have Whole Foods, Trader Joe's, local farmer's markets, and even the supermarkets here are full of organic produce. 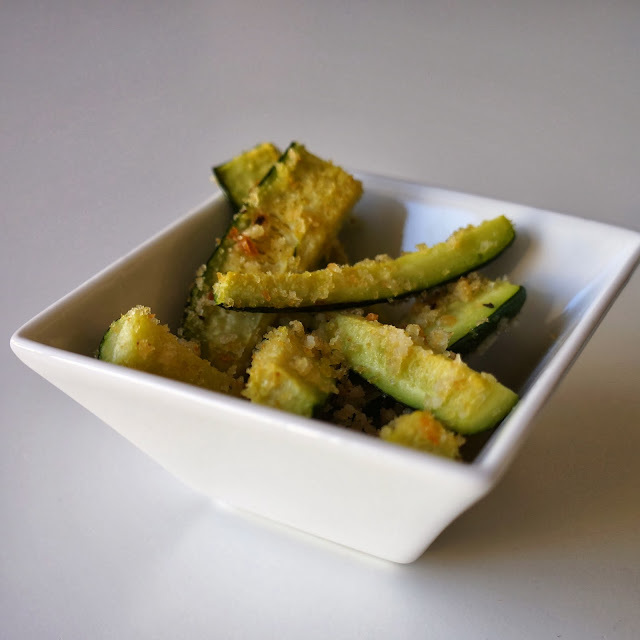 One of our favorite is zucchini squash. We eat it simply roasted with olive oil, baked in a quiche or sandwiched in a quesadilla. Austin loves it roasted, but I wanted to put a little spin to it this time. Instead of dicing them, I cut them in to sticks and sprinkled some homemade breadcrumbs on before baking them. It was hit with the little guy. toss the zucchini, olive oil, salt and pepper together. sprinkle with breadcrumbs. spread the zucchini on a cookie sheet in a thin layer. Making this today!! So ok, i'm planning to make this in bulk (for maybe today and tomorrow), how would you store it and reheat it so it's not soggy? hi js, i would spread it out on a wire rack to allow it to cool so that it doesn't get soggy. if you want to store it, flash freeze it and reheat it in the oven before serving.